Imagine The Sopranos, with snakes! The Lizard King is a fascinating account of a father and son family business suspected of smuggling reptiles, and the federal agent who tried to take them down. When Bryan Christy began to investigate the world of reptile smuggling, he had no idea what he would be in for. In the course of his research, he was bitten between the eyes by a blood python, chased by a mother alligator, and sprayed by a bird-eating tarantula. But perhaps more dangerous was coming face to face with Michael J. Van Nostrand, owner of Strictly Reptiles, a thriving family business in Hollywood, Florida. Van Nostrand imports as many as 300,000 iguanas each year (over half the total of America's most popular imported reptile), as well as hundreds of thousands of snakes, lizards, frogs, spiders, and scorpions. Van Nostrand was suspected of being a reptile smuggler by Special Agent Chip Bepler of the U.S. Fish and Wildlife Service, who devoted years of his life in an obsessive quest to expose The Lizard King's cold-blooded crimes. How this cat-and-mouse game ended is engrossing and surprising. "Riveting... [The Lizard King] captures in vibrant prose the dynamic personalities and habits of its human and reptilian subjects. "Who knew the world of reptile smuggling was so poisonous? ... Set in the mid-1990s, [The Lizard King] is reminiscent of the film version of Frank W. Abagnale's Catch Me if You Can: the determined lawman, the flamboyant scofflaw, the eventual showdown. Christy takes us deep inside the world of the smuggler... An exciting story of smugglers, lawmen, corrupt government officials, organized crime, and slithery beasts." 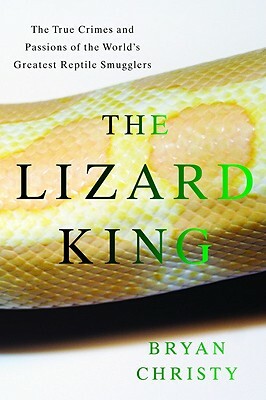 "THE LIZARD KING is a wild, woolly, finny, feathery and scaly account of animal smuggling on a grand scale, in a weird world so expansive that a few hundred stray snakes and turtles amount to peanuts.. . . Mr. Christy's entertaining book is about the crooks, swashbucklers and drug kingpins who constitute the underbelly of the reptile-dealing world . . . [The Lizard King] has a tangle of smugglers, agents, breeders and highly colorful minor players (like the tiger-purchasing Miami gangster who sounds like the prototype for "Scarface") with stories to tell . . . By the time THE LIZARD KING has escalated to describing the bear-gallbladder trade, it is rich with memorable moments." Who knew the world of reptile smuggling was as high stakes and character rich as an Elmore Leonard novel? Christy dives headlong into this subterranean world where a white python can fetch $100,000 and illegally smuggled frogs and frilled dragons are sold to pet shops and zoos. The tactics of reptile smugglers recall those of drug criminals-falsifying documents, laundering funds. This global operation centers on some of the notorious men of the Van Nostrand family. Though they're no less fearsome than the Corleones, Christy resists demonizing them. Instead, he emphasizes our enduring fascination with the cold-blooded. FOUR BUNNIES!" "Bryan Christy has fulfilled his contract as a writer on all counts; in this impassioned, noirish, funny, ruthlessly-researched masterpeice he has, with a poet's soul, given voice to the voiceless, shown us a world we could not otherwise explore on our own and born witness to the careless mentality of our collecting, consuming culture. This is The Orchid Thief, with fangs."